Get a weekend gig as a mayor. I feel pretty confident about calling Cities: Skylines the best city builder; it's certainly the one I've spent the most time obsessively tinkering with, returning every time a new mod or bit of DLC catches my eye. You don't need to rely on my correct opinion, however, as it's free for the weekend on Steam. Go build a utopia, or flood an entire city with poo. You've got until Monday to create your own city, which is plenty of time—just don't expect to do anything else this weekend. If it gets its hooks into you, the base game and DLC are all on sale, too. You can get Skylines and the Deluxe Edition for 75 percent off, while the DLC is 50 percent off, aside from Industrial and Synthetic Radio DLC, which have both been discounted by 20 percent. Out of all the DLC, Mass Transit and After Dark are probably the most indispensable, adding loads of transport options and districts. I'm also rather partial to Park Life, which lets you build custom parks, theme parks and zoos. It's a lovely palate cleanser after building a gross, smoggy dystopia. We've written a lot about Skylines since it launched four years ago—it's sold six million copies in that time—including what happens when four players try to run one city. There were casualties. 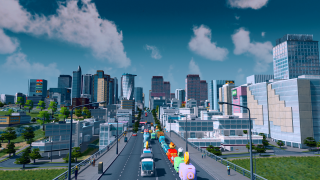 You can play Cities: Skylines for free now.